In June, MCDM launched the Four Peaks Summit, an executive training program consisting of a series of intensive, one-day sessions. It’s a great way for busy working professionals to learn more about digital media in a concise format. At this inaugural session, Anita Verna Crofts, Associate Director and Lecturer for the MCDM, provided insight on communications tools (such as Yammer), and provided tips on unleashing leadership potential in the workplace. Anita warmly (and appropriately) opened her lunchtime keynote address by declaring, “Food and Anita go together”. She invited everyone in the room to imagine life 15 years ago when she held her first leadership position in higher education. There was one email address for the entire department, Wi-Fi didn’t exist, and cell phones were the size of bricks. Oh how times – and the tools of technology – have changed. We now have more communications tools than ever to use – and learn. However, the core competencies of leadership remain the same. 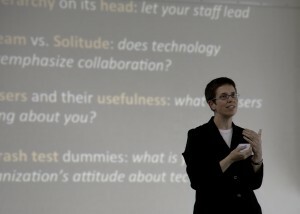 She highlighted five important things to bear in mind to make the most of communications technology and leadership. We must shed the idea that competency is tied to job title. You never know where leadership potential is going to come from. It may come from unexpected sources, but you must be open to discovering it. 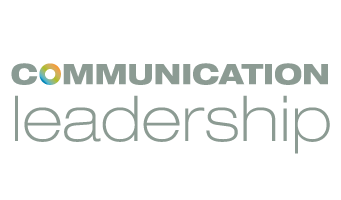 In order to effectively communicate with (and foster) future generations of leadership, we must have the flexibility to adjust our communications styles and expectations. The “post-email” era has arrived. The younger generation prefers texts to emails. Being “present” and productive can mean different things in the digital age. Anita referenced the enterprise-specific social networking and chat service, Yammer. In the modern work environment, there is an assumption that collaboration is king. However, there is value to simply spending time with yourself to allow your ideas to develop. While we have myriad electronic collaboration tools available, we must ask if the task at hand matches the tool. Sometimes its better to just pick up the phone or (gasp) walk over to a colleagues cubicle. As Anita puts it, the simple solution is often the most elegant. Electronic media platforms can be a great place to create engagement opportunities. Often users are wiling to share feedback and opinions when they otherwise couldn’t be bothered to draft an email. While it might seem daunting to open yourself up to criticism, companies and organizations can use these venues to glean uncensored information about what others are saying about the businesses. This is a great way to distinguish between what’s important to “us” vs. what’s important to our customers. Most of us have given a PowerPoint presentation at one point or another in our careers. Some have given many. However, very few have ever received training on how to do so. A great deal of technology is created by people who like to tinker, and there is an assumption that people will just pick it up and run with it. However, managers need to set up their teams for success and be cognizant of their training needs or knowledge gaps. The pace of change in a “permanently beta world” is so fast, leaders must teach not just about the tools, but also about the strategies. Now, more than ever, managers and leaders need to be trend spotters. Listen. Ask Questions. Listen More. To round out her talk, Anita issued a challenge to the participants. For a solid month, never use “I”. Instead, use “we” and “us”. It sends a message that you’re willing to stand shoulder to shoulder with everyone on your team, that you want to bring them along, and that you’re willing to build a bridge for the less tech-inclined. After all, an organization’s strength builds harmony when all members understand how it works, and can buy into its future and the mission.